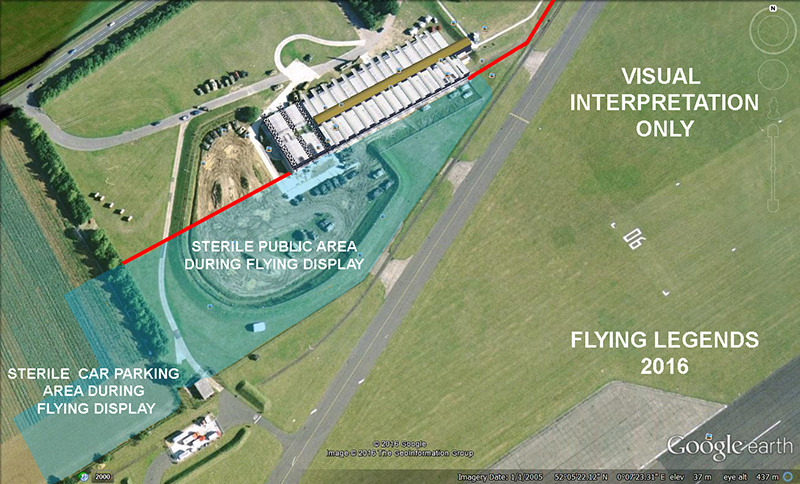 Flying Legends Duxford Crowdline Changes - Military Airshows News & Press Releases. UK Air Shows in 2016 have been subject to additional regulations after the Shoreham Hunter tragedy in 2015. Duxford's Flying Legends event, which takes place on the 9th-10th July 2016, is no exception and they have decided to change the crowd-line to make the event safer. As can be seen from the pictures, the grassed area in front of the Land Warfare Hall (also known as the 'Tank Bank') will be closed off to the public and the crowd-line will be moved forward in the central area of the museum site. Also a small area of the western car park will be closed off during the air display which means the public will not have access to their car in this designated area while the air display is on. The 'Tank Bank' has been a popular area for photographers in the past as the aircraft tended to bank over at that point and show their topsides. The area in front of the Land Warfare Hall was also popular with the public as it is a grassed area instead of hard concrete. This year, air shows around the UK including the Flying Legends Air Show, have been subject to additional regulations regarding flying display permissions. 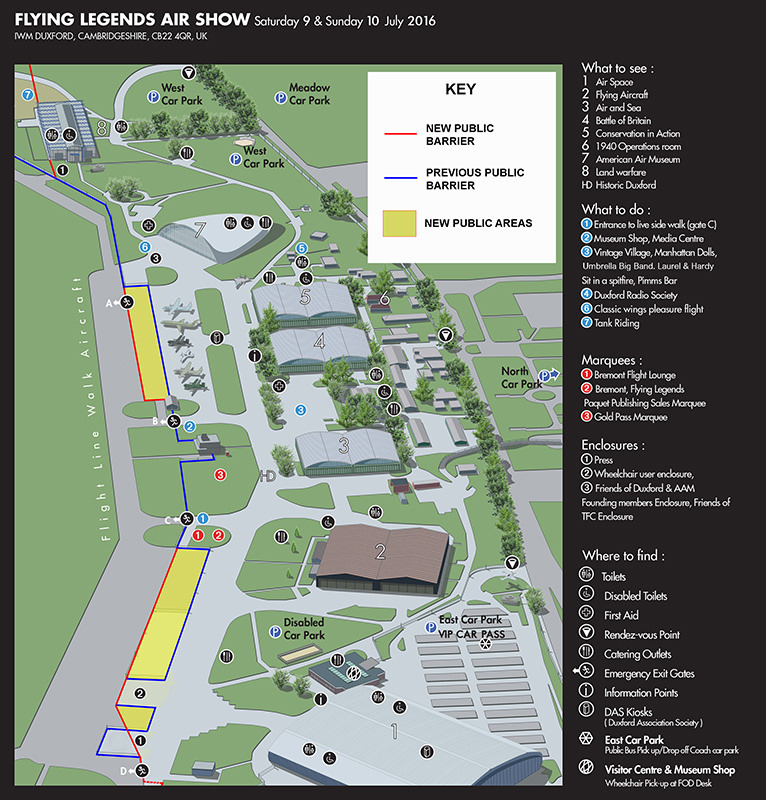 To enhance your visitor experience at this year's Flying Legends Air Show, run by The Fighter Collection, we will be moving the crowd-line forward in the central area of the museum site. To achieve this increased capacity in the central viewing area, we have had to make some difficult decisions, which has ultimately led to the Land Warfare end of the site not being a permitted viewing area from Wednesday 6 July onwards and for the entire weekend of the Flying Legends Air Show. There will be a small amount of sterile car parking which will be clearly designated. For safety reasons, visitors won't be able to return to their cars in this area until after the flying display has concluded. Please assist us by complying with instructions from staff at the air show. We hope that you'll understand the reasons behind these changes and we trust you will have an enjoyable Flying Legends Air Show.